All too often, we think creating change is about charismatic leaders and catchy slogans. Most often, change efforts fail because they seek to overpower rather than attract. That’s why to truly make an impact, you need small groups, loosely connected, but united by a shared purpose. In 1847, a young doctor named Ignaz Semmelweis had a major breakthrough. Working in a maternity ward, he discovered that a regime of hand washing could dramatically lower the incidence of childbed fever. Unfortunately, the medical establishment rejected his ideas and the germ theory of disease didn’t take hold until decades later. 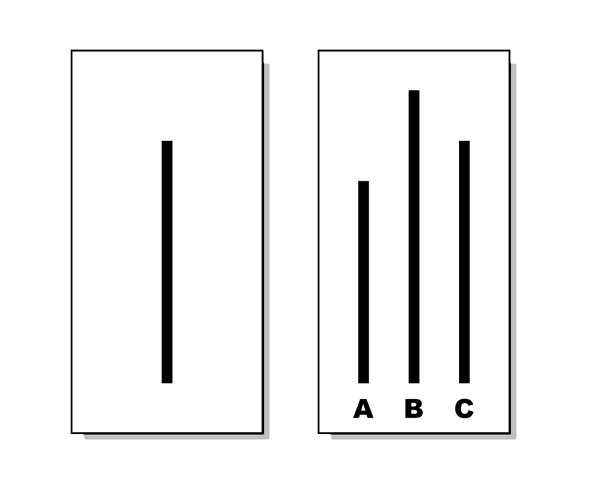 Each person in the group was asked to match the line on the left with the line of the same length on the right. However, there was a catch: almost everyone in the room was a confederate who gave the wrong answer. When it came to the real subjects’ turn to answer, most conformed to the majority opinion even when it was obviously incorrect. The idea that people have a tendency toward conformity is nothing new, but that they would give obviously wrong answers to simple and unambiguous questions was indeed shocking. Now think about how hard it is for a more complex idea to take hold across a broad spectrum of people, each with their own biases and opinions. As I explain in my upcoming book, Cascades, there is significant evidence that this is how ideas actually do spread in the real world. So if you want an idea to gain traction, the best strategy is not to try to convince everybody all at once, but to start with small groups with low resistance thresholds. They, in turn, can help you convince others and build momentum. That’s where the importance of leadership comes in. The role of a leader is not so much to guide and direct action, but to inspire and empower belief and a sense of shared purpose. You can’t expect people to do what you want, they first have to want what you want, which is why you can’t change fundamental behaviors without changing fundamental beliefs. Now we can see where Ignaz Semmelweis went wrong. Rather than working to gain allies among likeminded people, he castigated the medical establishment—those who had high resistance thresholds to a challenge of established beliefs. Instead of being hailed as an innovator, he died in an insane asylum, ironically from an infection he contracted there. The problem is that fantasies about overpowering your foes are much more romantic than doing the hard work of building traction in small groups and then painstakingly linking them together through forging a sense of shared purpose. Yet if you want to truly change the world, or even just your little corner of it, that’s what you need to do.